Coastal dunes protect the bay and community beyond from regular storms and wave surges that are a natural physical phenomenon on the Gulf of Mexico. Over the last 100 years these dunes have all but disappeared while human settlements have grown. Tourists visit who do not know dune ecology. Walking on living dunes is destructive. I always stand far away and use a telephoto lens to take these photos. But, even if we were all careful, even if there were no human beings around at all, the beaches would be carved away as they move with the current westward along the Gulf shores toward the Texas coast. 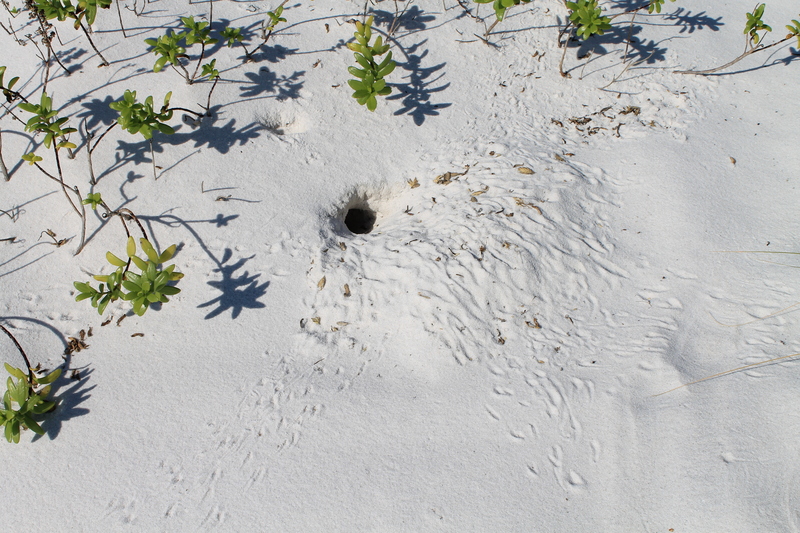 This is the nature of Florida’s Gulf barrier islands. This has been true for all the geologic time that the Appalachian Mountains shed quartz crystals into streams and rivers through weathering. Those grains of quartz broke from the granite skeleton of the ancient mountains, rolled down rivers to the sea…to the Gulf where currents pushed them together and formed the spectacular Gulf Islands tourists come to see and photograph. This happened over millions of years. We short timers only see what is in front of our eyes; we really think that we can alter natural processes this vast and this old. That faulty perception threatens our lives and fortunes. We are facing a decision locally about whether to re-nourish the beaches to support tourism (to the tune of millions of dollars). This is a process of bringing in sand from other locations to widen the beach temporarily. Beach renourishment happens all over Florida where hotels and other large structures increase erosion along highly mobile coastal environments. Local ecologists recommend moving tourism to the mainland along the bay with only the recreational sports businesses remaining on the beaches. This would remove much of the hardscape that comes with hotels, walkways, and their infrastructure. These replace natural dunes and the vegetation that holds them together through storms and wave surges. Of course this is very controversial and not something most leaders or business owners support. It would take years to make the change but going toward a more responsive process, where humans adapt to the landscape and weather rather than forcing nature to adapt to human need, would be very enlightened. It signals a sea change in thinking that is very much in need as we move into a new era of unpredictable climate. The transition is the difficult part but with keen minds and the right intent a plan could be formed where – rather than rebuild after a hurricane, or refurbish when a structure is in disrepair – the business would relocate to the mainland. Others may decide to do so ahead of time as the downtown becomes more vibrant and can support more hotels. Rather that selling the ocean front view, the emphasis could be on historic Port Panzacola and the lure to visit the islands. The challenge would be how to use the historic downtown and bayfront to support a thriving tourism business supported by ferries and trams out to the beach – where recreation, nature study, and sea side fare would be the focus. Would harboring one of the most natural and beautiful landscapes in the world improve tourism? We’d be unique, we’d be leaders and we might find a way forward that is even better than what we envision now. I think there’s a far greater concern for our beach, than the dunes. They are drilling now off the shores of Florida for crude oil now. Once they have their foot in the door – that’s it; they’ll expand further into the State. We need to focus on protecting the Gulf waters and shutting down offshore drilling. Another problem w/off shore drilling is seismic testing, which they are NOW conducting off the shores of Alabama and Florida. Seismic testing kills dolphins and whales, or at the least leaves them deaf and unable to communicate.